It was February 5, 2013. I was innocently lying in a hospital bed at about 12:30 p.m., when Fluffy walked into the room. Fluffy came every day to visit, but he usually showed up about 7:30 p.m., after work. A visit at 12:30 p.m. was not a happy surprise. “I got laid off from my job today,” he said. This was catastrophic news. February 5 was my second-month anniversary of being in the hospital. We did not know it at the time, but I had exactly one more month — to the day — of incarceration. You can imagine how high our hospital bills eventually got, even with the good insurance that we had. Fluffy looked for a new job — well, he looked little. I don’t know how else to describe it. What was he going to do? Eventually I was going to get out of the hospital. I was so helpless that I could not hold a fork in my hand. I could only roll over in bed if I had metal grab bars on the side of the bed (and there were no grab bars, metal or otherwise, on the bed at home). I couldn’t walk, of course. I couldn’t sit up unless the seat belt on the wheelchair held me in position. I couldn’t roll myself from one room to another in my wheelchair because I was too weak to move the wheels. I couldn’t so much as brush my teeth without being helped. As we talked about it, it was obvious that once I left the hospital, Fluffy would not be able to get a job outside the home. He couldn’t leave me for a half hour, at least at first. And my personal care was only part of it. There was also the house maintenance, the cooking, the laundry, and the yard work. When could Fluffy get a job at all and be fair to his employer and still do the things that taking care of me was going to require? Never, that’s when! Talking it over in that hospital room, we realized that Fluffy’s retirement date had just moved up a couple of years. For his entire work career, Fluffy had planned to retire when he was about 66 years of age. All the wheels were in motion for that magic date, but life had not cooperated. He was years away from that much-anticipated date, but our best-laid plans had gone haywire. I had a salary from my own part-time job. Most of my salary was devoted toward paying off my debts, but there was a four-hundred-dollar allowance that I allocated myself every month to spend on riotous living. I used the money to take Fluffy out to dinner, to purchase birthday and Christmas presents for family and friends, to buy clothes, to shop on Amazon or eBay, or to otherwise squander throughout the month. I didn’t exactly go crazy, mind you. Well, maybe I took Fluffy out to a whole lot of restaurants. But it was my four hundred dollars, and I spent it however I wanted to. But as we discussed our future, we decided that if Fluffy couldn’t work because he was taking care of me, then I needed to use my four hundred dollars to hire Fluffy. I wasn’t going to give him my entire allowance, mind you, but the “riotous living” part had to go. We were lucky to have money saved in a rainy-day fund, and that savings would pay for the essentials in life such as medical care, utilities, property taxes and gasoline for the car. I would use a hefty part of my $400 allowance to buy most of our groceries, to cover Christmas and birthday presents for friends, and to continue to provide the entertainment such as taking us out to dinner or buying food when we entertained at home. In essence, Fluffy would become my full-time employee — the cook, the housecleaner, and the yard boy. He would also provide medical care and become my chauffeur, all in exchange for his share of my $400 allowance. 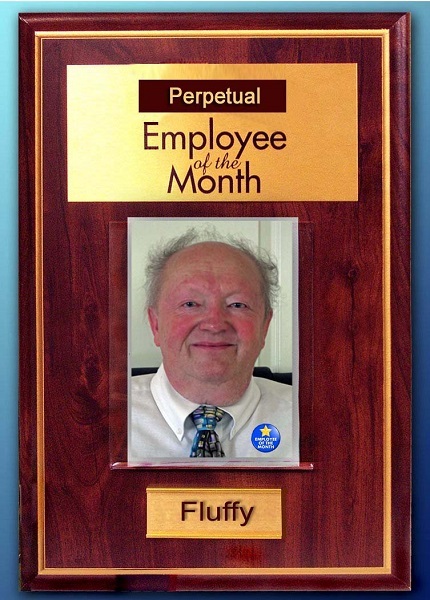 Fluffy, the Perpetual Employee of the Month. Let’s just say our lifestyle is not what it used to be. Part of it is that I’m just not as mobile. It is not as easy for me to go places. For a long time I didn’t want to go anywhere. Now that I can go places — well, the budget just doesn’t allow grand excursions. And we are fine with that. We go to the supermarket once a month rather than once a week. After that, Fluffy goes to get small things like milk or cheese or tomatoes that we need and that won’t wait until the next big grocery trip. If he goes by himself, with that small list, I won’t be with him to be tempted by that gorgeous eggplant or the Wegman’s vanilla pistachio ice cream. Fluffy has turned into a grand little cook. Sometimes we’ll just have his homemade biscuits and jam for dinner. Or we’ll have a sweet potato — loaded, of course — but nothing else. Or a wedge salad. Our nighttime dessert consists of “the twenty” — ten mint-flavored M&Ms apiece, period. Once you’re old, you just don’t eat as much as you used to eat. Or maybe, when you’re old, you realize you shouldn’t be eating as much as you used to eat, whether you want to or not. So you don’t. We lived on my four hundred dollar allowance for more than a year. Then, a few months ago, we realized that it wasn’t enough. My American Express bill was burgeoning where it shouldn’t burgeon. I was starting to panic, and I didn’t know what to do. Fluffy had the solution. “Let’s start living on $300 per month,” he said. “Are you crazy?” I shouted — but I only shouted in my mind. Inwardly, I knew he was right. So I sighed and said, “Let’s try it for a month and see how it works.” We tried it, and we never looked back. We have made an adventure out of our new lifestyle. Fluffy looks for coupons at restaurants we like, but we only use them occasionally because it’s not in the budget. I also look for mystery diner assignments to supplement our restaurant habit. I have to be careful not to make a mistake, though. If I accidentally do a “phone-ahead takeout” instead of a “walk-in takeout,” for example, or if we run into friends at the restaurant and sit with them, I will not be reimbursed. I’ve learned that the hard way. We also order with doggy bags in mind, because we’ve learned they can be a gold mine. Lunch at the Outback can turn into three meals, if you’re careful about what you get. And if you go on Wednesday and get the special, you can get out of there for $11.99 each. I longingly wait for the time when we can go to restaurants whenever we want to go. That magical day is 14.7 months in the future, according to my debt spreadsheet. On that day I will be out of debt and we can go to the Cracker Barrel six days a week if we’re of a mind to do so — which we won’t be, I assure you. As much as we love the Cracker Barrel, we have more expensive tastes than that. Most of our entertainment is done at home. We can invite a couple over for dinner and make potstickers together for a little more than six bucks. Or we can do something in the crockpot. In the summer, we can barbecue. Fortunately, our friends seem to like our company even though we usually have chicken or hamburgers instead of steaks. After the dinner was over, leftover food was sold on a pay-what-you-think-it’s-worth basis. Fluffy and I took ten dollars out of our “frippery fund,” planning to get two little zipper bags full of the barbeque meat to take home with us. When Fluffy went to the kitchen, he learned that John, our home teacher, had purchased a whole tray of the meat for us. I went home and cried. I didn’t know why I was crying — whether I felt sorry for us because we needed the food, or because I was so grateful that John had been inspired to know that we needed it. We don’t talk about this stuff to other people. After all, we live in a really nice house. We don’t look like people who are living on a shoestring. John had no way of knowing how important that food would be. I was depressed about it for a couple of days until finally my good sense won out. The food was a blessing and John was the conduit of that blessing. We were fortunate to get it, and I was embarrassed that my pride had stopped me from feeling the gratitude I should have felt. Let’s be honest for a moment here, shall we? We wouldn’t be living on a shoestring if I hadn’t continued using my charge cards for the four years I was unemployed before I got my current job. Yes, a lot of the charges I made during those days were pretty much unavoidable — but just as many of them weren’t. If I had been more frugal then, we wouldn’t be in this situation now. In 14.7 months, all will be well. Until then — well, until then I am paying the penalty for my choices the same way people pay speeding tickets after they’ve been caught in a radar trap or they wait for broken ankles to heal after they make the mistake of walking off a curb and breaking a bone. People who make mistakes may repent, but they are still responsible for the consequences of their actions. Meanwhile, I may not have money, but I have the services of the Perpetual Employee of the Month. He and I do crazy things together. Last week we steam-cleaned the refrigerator. (It has been sanitized for our protection.) Not many people can say they steam-clean their refrigerators, but not many people have full-time employees to help them do the job. Today we motored over to a nearby subdivision to exchange a wheelchair. Tonight Fluffy made Brazilian cheese biscuits (Pao de Queijo) for our dinner. Tomorrow I will be chauffeur-driven to the temple. And Fluffy does everything with a smile on his face. What more could I ask? About a month ago, we decided that I had recovered enough that Fluffy could go back to work if he wanted. But we also both decided that we were having too much fun being retired, even if our lifestyle had to change to be less extravagant. We’re not sure how much longer we’ll be on this side of the turf, and we would happily sacrifice some extra money for more time together. If you are in the process of repenting for something, or paying restitution for something, have heart. Someday, restitution will be made. Whether in this life or in the next, all will be well. The important thing is that God loves us, and others love us (maybe even without our knowledge). This is a wonderful world, despite its challenges. Sometimes the hard things are the things that help us to grow the most. If that’s the case, these 14.7 months are going to make me a stellar individual. And after the 14.7 months are over, I am going to keep Fluffy as the Perpetual Employee of the Month, and I am going to take him to the Cracker Barrel as often as his cute little heart has a mind to go. He deserves it.